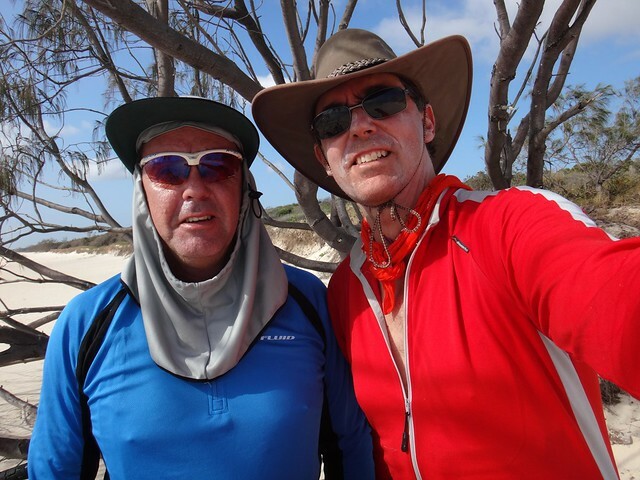 The aim of today’s adventure was to ride up the coast of Bribie Island as far as we could, then ride back south via the inland trails. 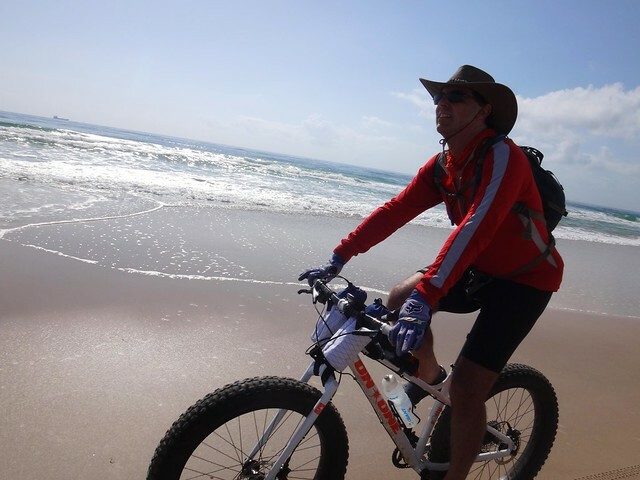 My friend Murray is so enthusiastic about “Fat Bikes” that his nickname is “Fat Muz”. 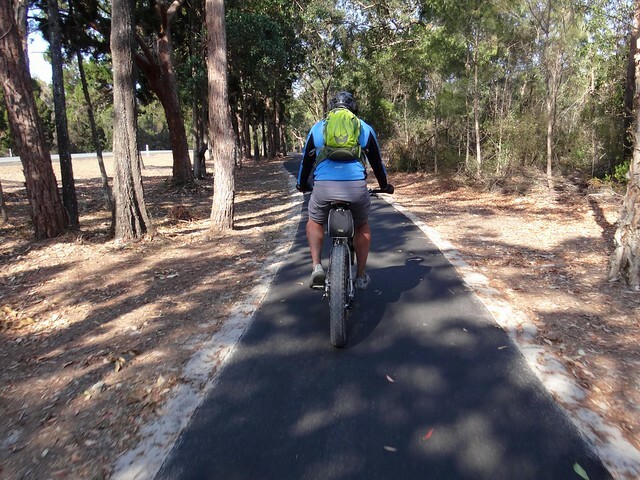 He’s not fat – but the tyres on his bike are huge. I had managed to borrow a fat bike from a kind friend, and Murray agreed to ride with me for the day. We started at Woorim on the south-eastern tip of the island. It was low tide, which gave us a firm and generously wide causeway on which to ride. 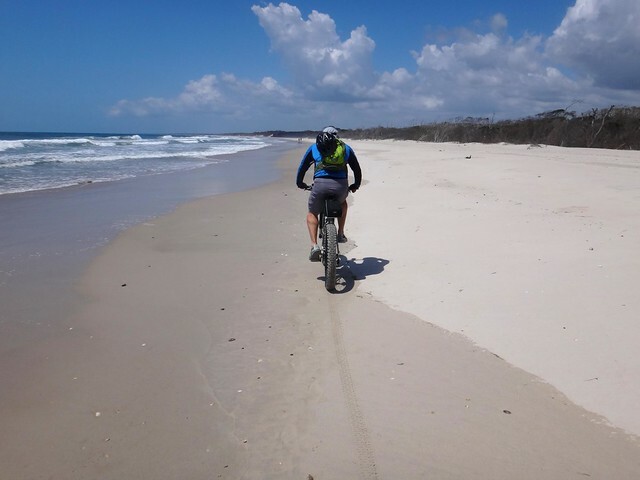 We pointed the bikes northwards and started pedalling with a gentle breeze wafting over our shoulder, the waves breaking on our right, and an endless and empty beach stretching off into the distance – it was delightful. There are several lagoons near the beach. We decided to stop at the first one on the way up. The water is stained brown by the tannin from the trees but it’s still beautiful. 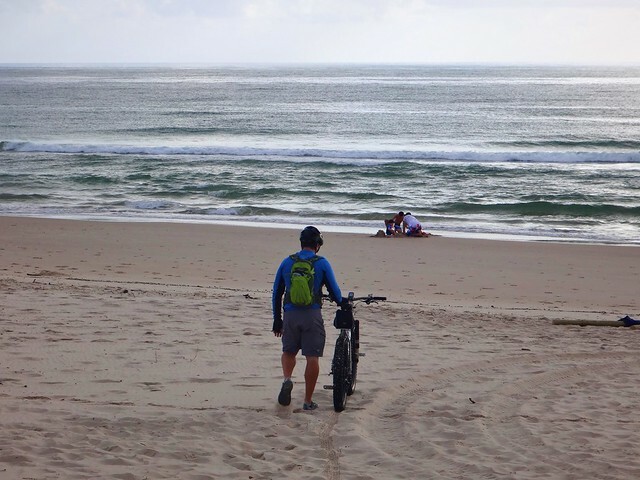 I noticed how difficult it was to pedal the bike once we got off the firm sand near the beach upto the softer sand near the lagoon. 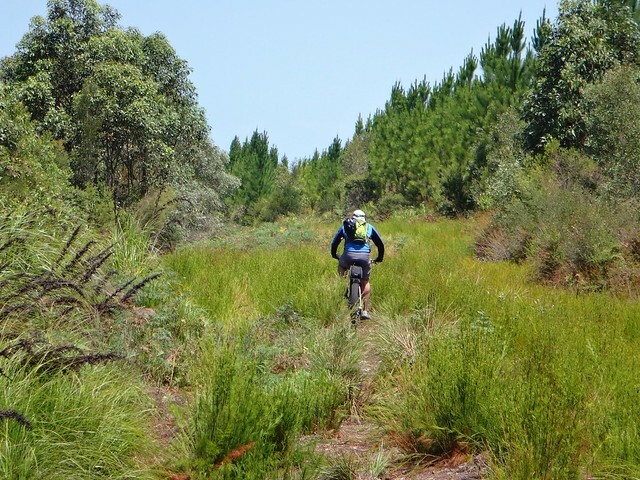 Even though these bikes have fat tyres, there are still places where you have to work really hard to ride them. 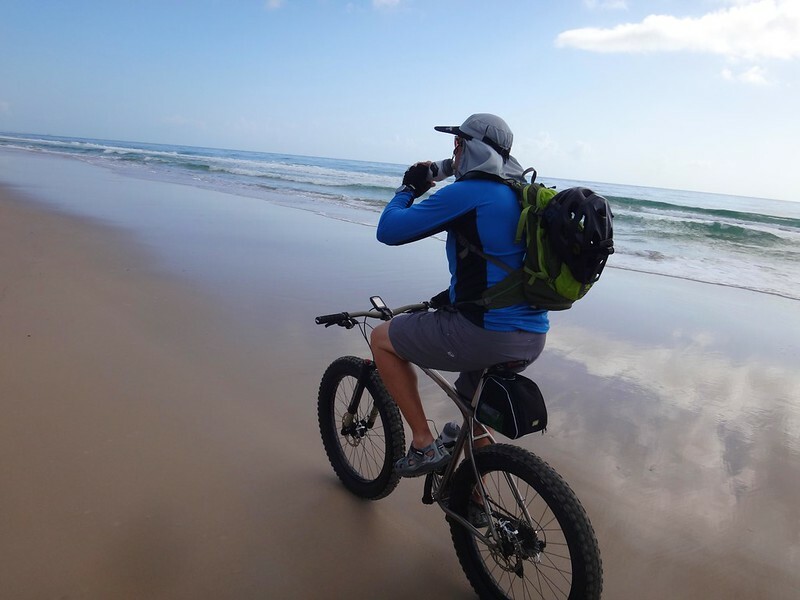 Soft sand is tough terrain – even on a fat bike. 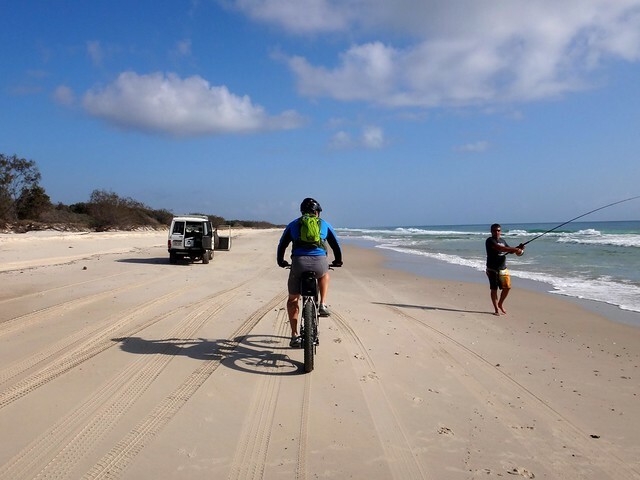 As we continued our journey up the beach, we were passed by a few 4×4’s on their way northwards. Every now and then we’d pass people fishing, or lazing under trees, or splashing about in the waves. Everyone was happy. The sun rose higher in the sky and the day grew hotter. 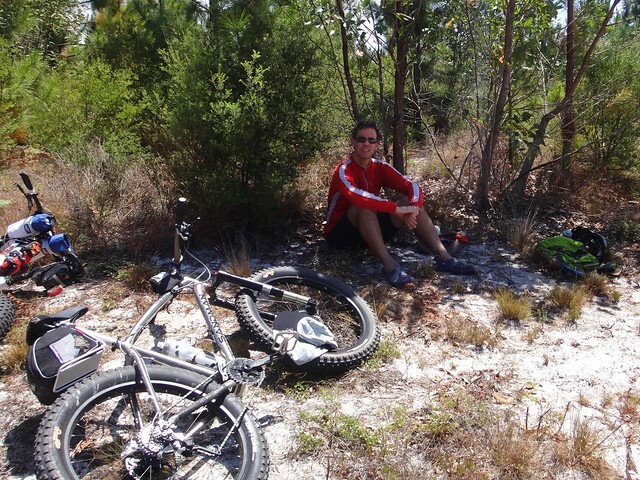 After an hour we decided to have a quick break in the shade of a tree on the edge of the dunes. I swapped my helmet for a broad hat and a bandanna. Murray’s “hat” trumped mine. It looked awesome. We eventually came to “Fort Bribe”. 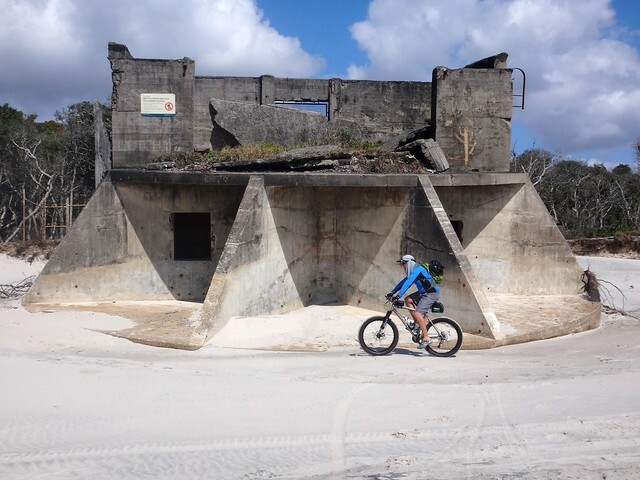 These ruins from the Second World War are reminders of the strategic importance that the armed forces placed on Bribie and Moreton Islands as they defended Moreton Bay from enemy attack. Slowly the buildings on the northern horizon swelled in stature, and sooner than expected we were standing on the northern tip of the island gazing across the narrow passage towards Bulcock Beach at Caloundra. A couple of my friends have dreamed how cool it would be to ride to the top, and have a friend waiting with a tinny to ferry us across the passage to civilization. It sounds like fun, but the practical part of my mind wonders how you’d safely carry a bike on an unstable little boat. We thought about having a bit of a swim, but I don’t think either of us wanted to go to the trouble of getting changed, getting wet, getting dried, then getting changed again. 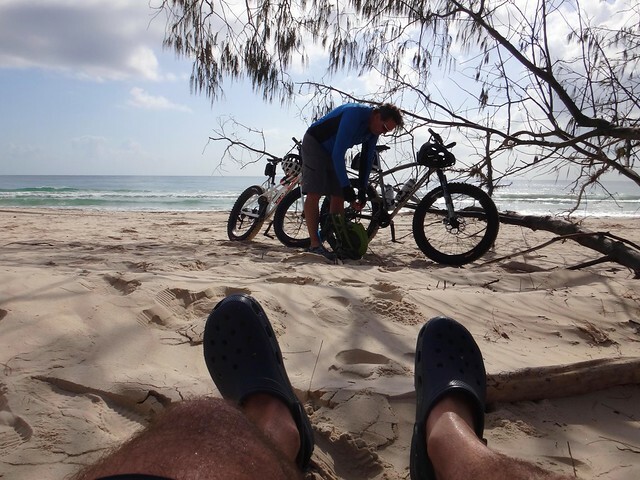 So we rested the bikes on the sand, had a snack, and cooled our feet instead. Conditions started to change as we rode back down the beach. The tide was rising. 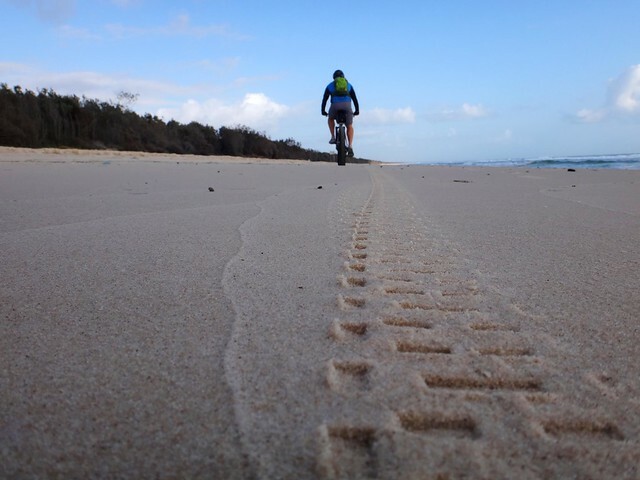 Sand which was once firm, crusty and easy to ride on was now soft and boggy. The further we went, the softer the sand. Eventually we ground to a halt. 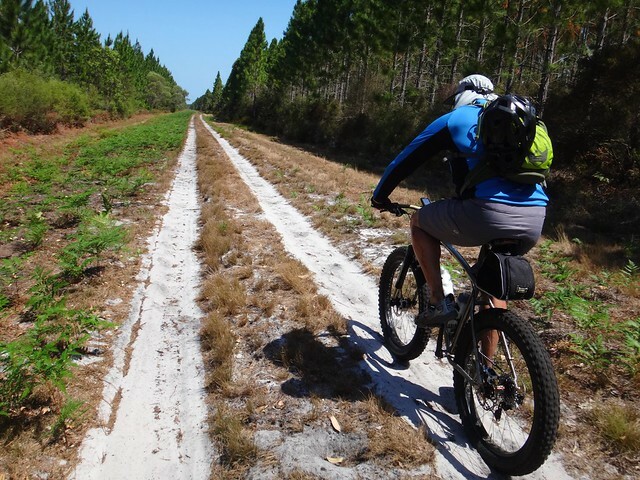 We decided to complete the southward leg of the trip via inland tracks. We wouldn’t be subject to the tides, but some of those tracks had mountains of soft boggy sand. This was going to be hard work. 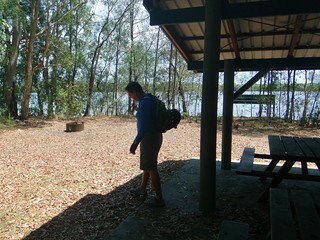 After a kilometre of battling soft sand, we had another break at a shady picnic shelter at “Lighthouse Reach”. I noticed that I was using a lot more water than I normally did, and topped up my spare bottles from a rain tank, adding some Micropur tablets to kill any greeblies. What followed can only be described as two kilometres of heart-break. The sand was soft and unrideable. But, being away from the sea breeze, it had also been baked scorchingly hot by the sun. When we tried to walk on it, it filled our sandles and burned our feet. It was painful work even pushing the bikes. 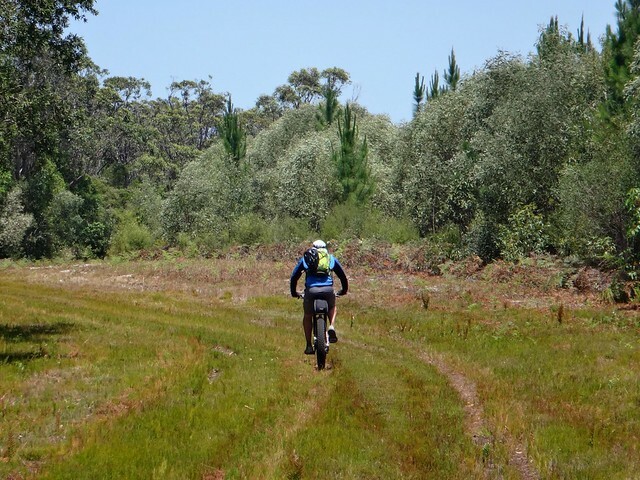 We eventually found some secondary trails leading off from the main track and followed them. They were rideable, at least, but the rough grass made progress slow. I relaxed under this small shady tree for what seemed like ages, cooling off. The trails got rougher, but were mostly rideable. They were pleasant, too. On our left side we had native scrub forming part of the national park. On our right we had pine forest. We had to cross a couple of small creeks. 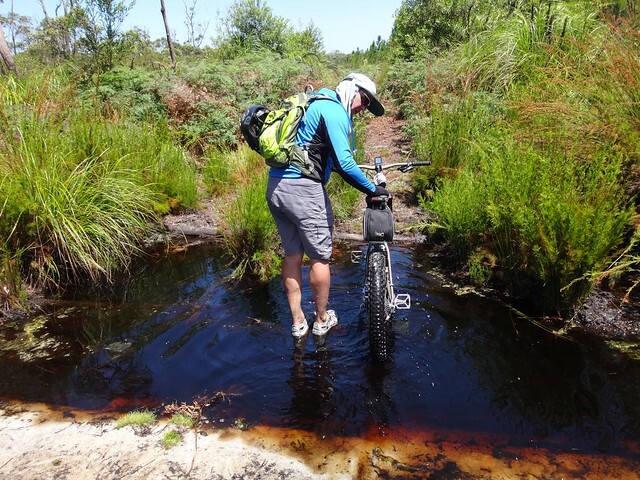 Remembering the disaster I experienced when I last tried to cross a creek, I hopped off the bike, and crossed with the utmost care. My knee thanked me profusely. The track veried between hard-pack and loose sand. 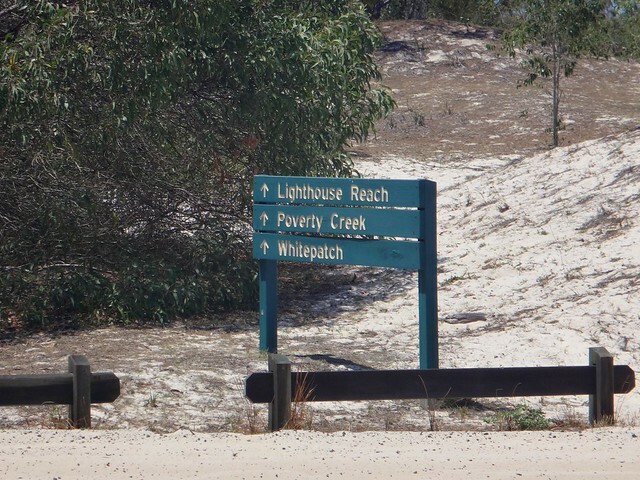 We eventually reached a turn-off which would lead us to the beach, but decided against going back on to the beach. It was now about 1.30pm, and the tide would be all the way up the beach. We continued to follow the inland track instead. This was good and bad. 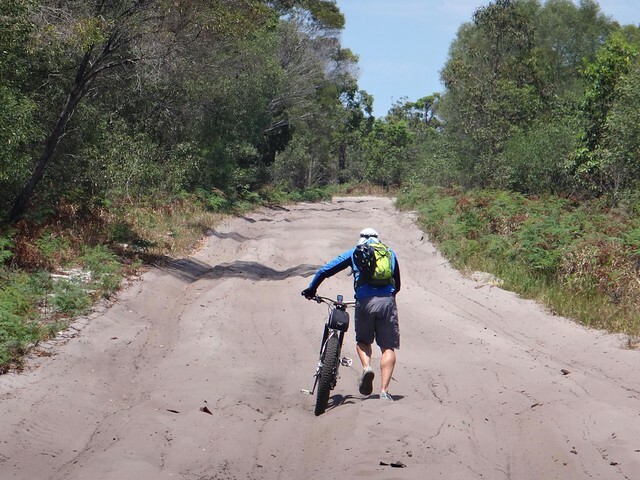 The last few kilometres of the inland track featured some really soft sand. We were tired, hot, and sunburned. It was a major effort to keep the pedals turning, but we did. The track ended near “The Twin” cinema on first avenue. We staggered in and Murray bought me a huge (600ml) cinema Coke. As I rested in the deliciouly comfortable leather chair, I started drinking and couldn’t stop. As soon as I finished it I aked for another and downed it just as quickly. We had finished with sand for the day. 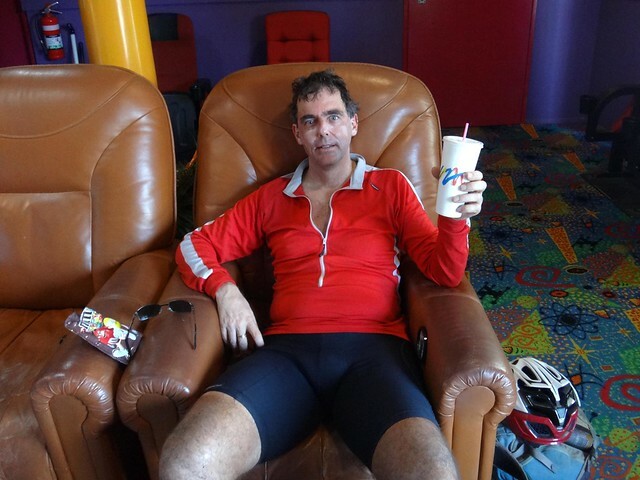 I “sloshed” on the bike as I rode the bike track, full of soft-drink. Although it took us about two hours to reach the tip of the island, it took us over 6 hours to get back. All up we rode 67km in just under 9 hours including breaks. 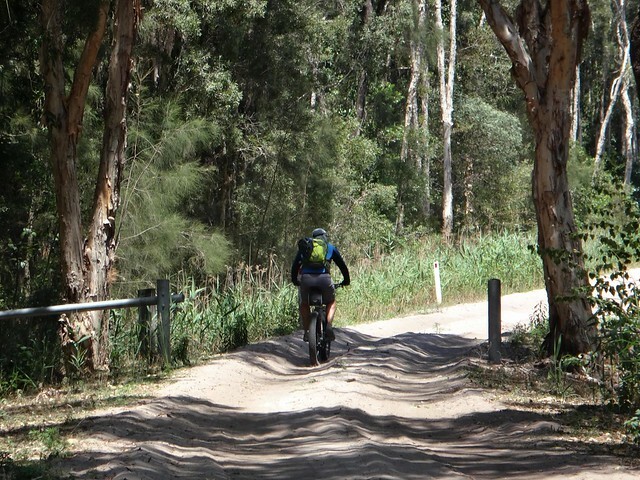 Although this “flat” ride only had a feeble 217m in elevation gain, this was one of the toughest rides I’ve ever done. 1. 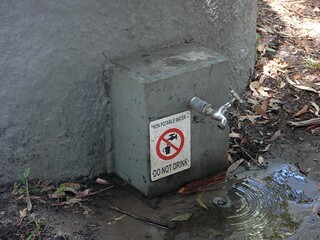 Take plenty of water. 3. Use plenty of sunscreen, and re-apply it. Put it ALL over. 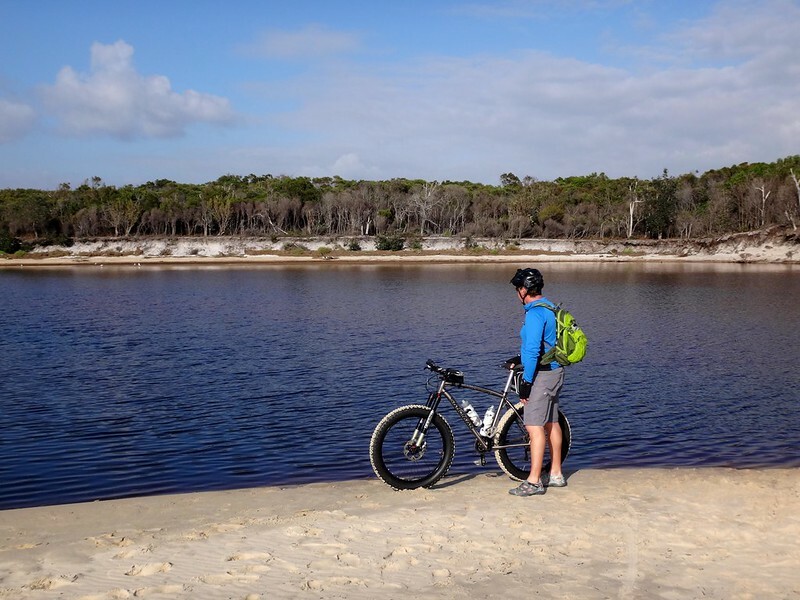 Radiation at the beach is multiples higher than what you’d experience on a normal MTB ride. 4. Check the tides. 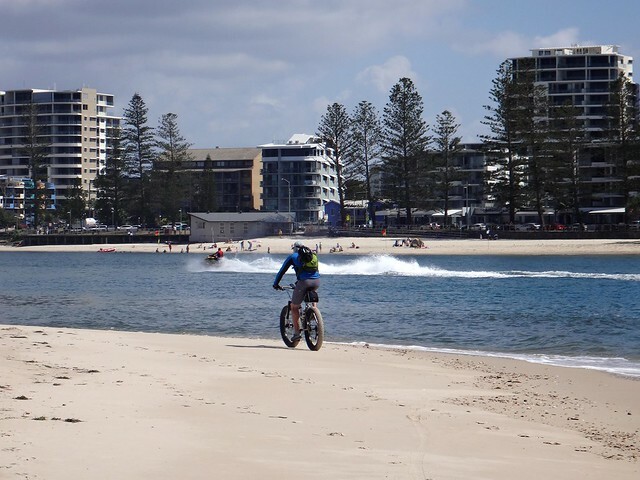 You can’t ride a fat bike on the beach at high tide. 6. 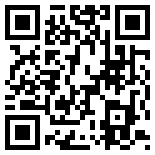 Do it in winter. 7. 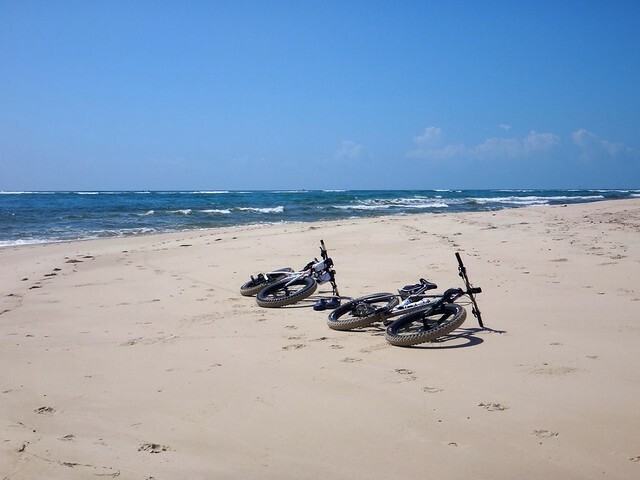 Remember that beach rides are not symmetrical. What takes you two hours in one direction can take you six hours on the way back. Thanks Murray for an awesome ride! Nice write up Neil. 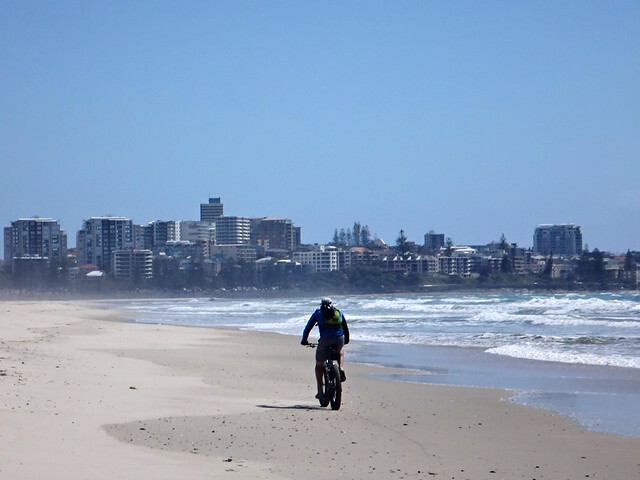 You can see why I love riding the fatbike on the beach 🙂 Troy. Thanks Troy! I’d love to try it at night sometime. Top effort Neil. 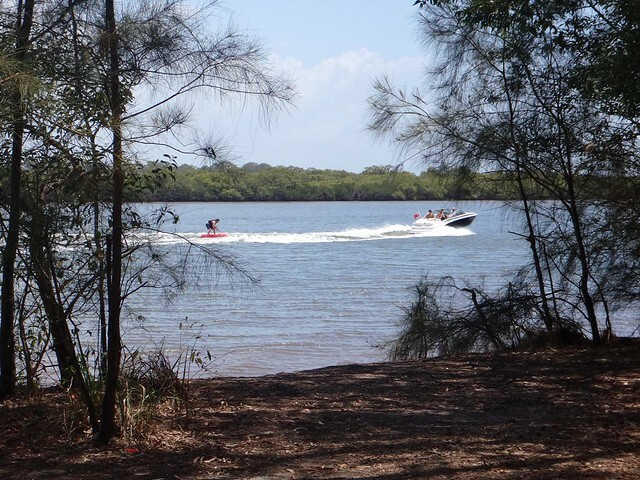 The tip of Bribie is a beautiful spot – your photos capture it well. 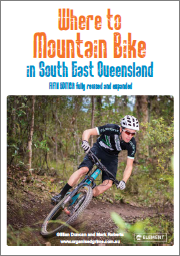 I winced when I saw the ‘sunburn’ shots on MTB Dirt – ouch! The chaff bags seem an excellent way of increasing water capacity particular when a framebag is attached – will have to look into them. You can get the Chaff Bags from BikeBagDude.com – they’ll fit almost anywhere.